Angle of view is a measure of how much of a scene or subject a lens can take in. Expressed in degrees, the angle of view can be measured horizontally, vertically or diagonally across an image. When photographers talk about a lens' focal length, what they're really concerned about is the angle of view. This is because the angle of view determines how a scene can be framed and composed. 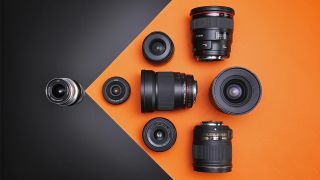 Long lenses with focal lengths of 200mm, 300mm or 400mm and beyond offer narrow angles of view that make it easier to isolate objects within a wider scene. The drawback to having an angle of view of just a few degrees is that it's equally easy to lose track of a subject, as a slight shift in the position of the camera can have a dramatic effect on which area is picked out by the lens. This problem is compounded if you're following a moving subject, as anyone who's tried photographing fast-flying birds up close through a 600mm lens will know! Wide-angle lenses flip this problem on its head. Focal lengths in the region of 16-35mm are capable of sucking in a great deal of a scene in one photo, and consequently it's easier to initially frame the shot and to recompose quickly.